A rare air-to-air shot of Duclie flight seeing in the Northern Territories over Bullo River Station, during the Stanford Alumnin Education Travel air tour of Australia in 2003. Desktop publishing as in-house designer for Pionair was a path of discovery. Why is striving to make something look better worthy toil? There are benefits to clarity, ease of understanding for busy people justifies hours in production. Pleasing design that’s attractive in useful ways, needs no apology, even in technical publications, and in design for travel and tourism making visible what others only imagine, feel or think is necessary. Artistic expression in visual communication can be placed on the same level as informational expression of key messages. Pionair Australia was simultaneously an airline that specialised in private air charter and air cargo and a ‘best in class’ tour operator. This is the advertising and marketing campaign I produced in 2006 to celebrate the pinnacle in the company’s Classic DC3 airliner phase of development in New Zealand and Australia—namely a series of highly successful ‘Circumnavigation of Australia’ Airtours that Pionair had designed and delivered to three U.S. ‘Ivy League’ University Alumni Associations’ Travel / Study programmes, namely Harvard, Stanford and Duke Universities for the 2002—5 Australian travel seasons. The Australian winter is the best time for touring which naturally coincides with the U.S. winter vacation period, the Australian Circumnavigation by Classic DC3 airtours were 17 days in duration. During the same period Pionair also ran Classic DC3 ‘Discover New Zealand’ Airtours for the same set of Ivy League Universities. 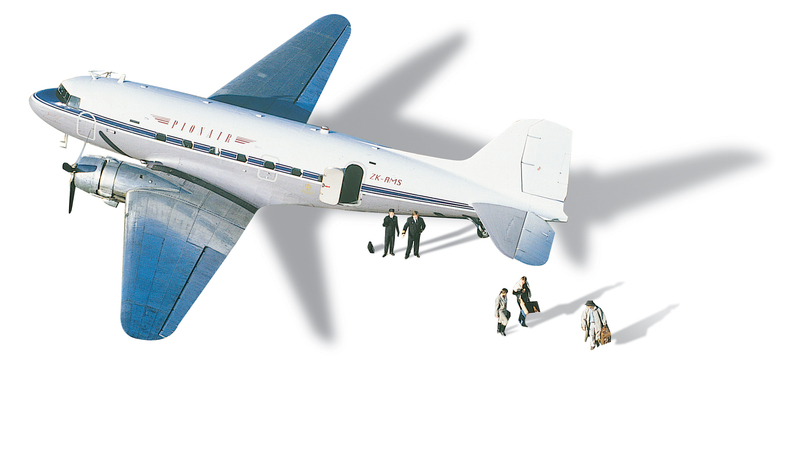 The Golden Era campaign theme also launched the new Pionair Australia company, operating out of Sydney Bankstown airport with two aircraft, the hangar queen ‘Dulcie’—the immaculate DC3 airliner that is the hero of the campaign and a business class Convair CV580 turboprop airliner. The foundation of the Golden Era campaign was developing the the historic Pionair brand into a full brand and identity system for the first time. Pionair took off in 1991, it’s name paid homage to the glamour days of European air travel—‘Pionair Class’ was considered to be the way to fly across Europe. Pionair began service in New Zealand adopting that same early spirit of adventure travel, when getting there was both extraordinary and fun, over the next decade it rose to became a leader in both private air charter and customised tour development in the South Pacific region. The private airline began in Queenstown with one meticulously restored DC3 airliner, air touring New Zealand and Australia. 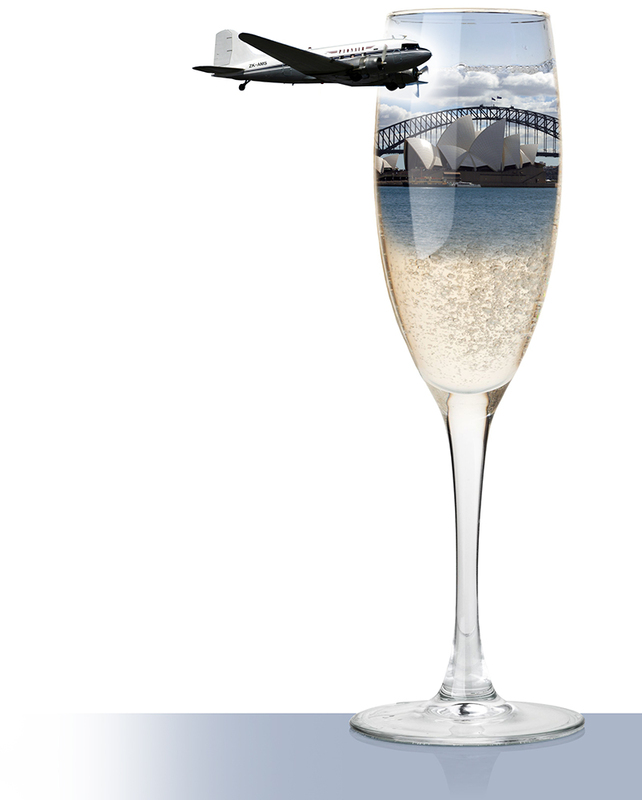 Pionair offered a premium, yet relaxed personal service, showing each guest the very best that downunder destinations have to offer. The hangar queen of this brochure is ‘Dulcie’, the immaculately restored DC3 skyliner ZK-AMS—her lavishly appointed cabin and alert, attentive crew kept alive the spirit of ‘Pionair Class’ classic adventure travel.